Hannah Jenkins would have spent her summer gardening at NIU for free. But, as the first paid intern for the college’s Communiversity Gardens, she was happy to earn a paycheck. Jenkins, a 21-year-old environmental studies major at NIU, earned the position as part of a Tyson Foods Summer Community Internship Program. A partnership between Campus Compact and Tyson Foods, the program provided 40 nonprofit organizations in the Chicago area, as well as Sioux City, Storm Lake and Council Bluffs, Iowa, with a grant of $3,000 to $3,500 to hire college students for the summer. 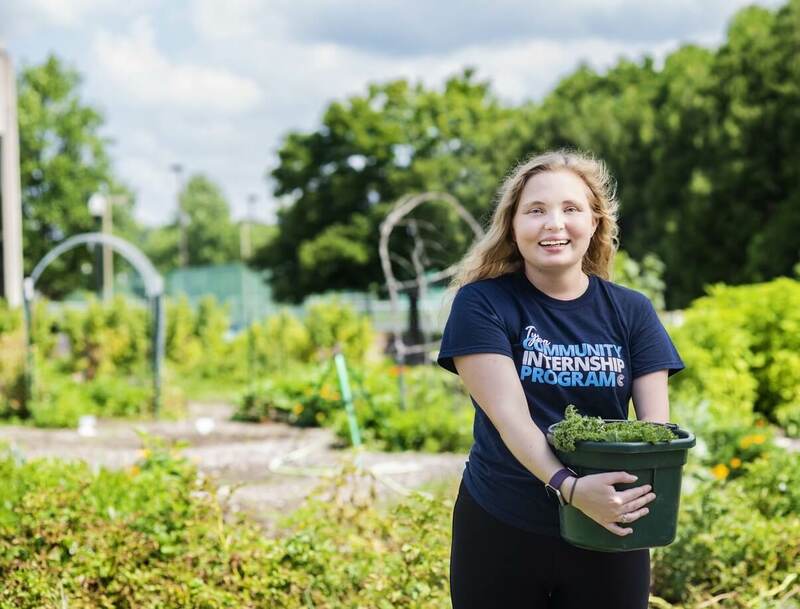 A Libertyville, Illinois, native, Jenkins worked this summer to raise awareness of the vegetable garden, its importance at NIU and the need for volunteers to help maintain it. Along with her efforts on campus, she was able to network and learn from the program’s paid interns throughout Illinois and Iowa. Unlike Jenkins, most worked at nonprofit community organizations, not on a college campus. Communiversity Gardens opened in the spring of 2014 on the east side of Anderson Hall to provide food for the Huskie Food Pantry and a resource to educate students about sustainable farming. Jenkins first became involved through the NIU course Introduction to Sustainable Food Systems, which allows students to use the garden as their classroom. “It’s a good way to get people thinking about where their food comes from, and the fact that not everyone who needs it gets good healthy food,” said Melissa Burlingame, co-manager of Communiversity Gardens and assistant director of the Institute for the Study of the Environment, Sustainability and Energy. Burlingame sought out the grant along with Michaela Holtz, also the co-manager of Communiversity Gardens and the director of the Office of Student Engagement and Experiential Learning. They’d eventually like to see all interns at Communiversity Gardens paid. One to three unpaid student interns typically lead volunteers and manage activities at the garden during each growing season. “This was a big deal for us,” Burlingame said of the Tyson Foods Summer Community Internship Program. Jenkins grew up visiting forest preserves and gardening with her mother but didn’t realize she could turn her love of the environment into a career until her sophomore year after learning about the Environmental Studies major at NIU. She’d switched her major from journalism to English and then political science, before deciding upon environmental studies with a concentration in environmental policy. She plans to go to law school. “I really liked political science, but I felt like something was missing. When I talked to people, they asked me, ‘What do you care about?’ In high school, everything I wrote about was the environment. It kind of clicked in my head, ‘I’m not in the right thing,’” she said. Communiversity Gardens typically has six to eight volunteers at a time during the school year, drawing them in through a Facebook page, word of mouth, university announcements, emails and faculty contacts. During the summer, the volunteer pool tends to dry out. Through social media and other means, Jenkins has worked to develop a consistent way to keep a strong network of volunteer students, faculty, staff and community members available on volunteer days–4 to 6 p.m. Tuesdays, Thursdays and Sundays beginning in April. Throughout Jenkins’ internship, she’s become a valuable resource for fellow students with gardening questions, Burlingame said. “It’s just been fun watching Hannah get involved in so many different things,” she said. As she’s worked to raise awareness of food insecurity on campus, she’s also strived to change perceptions. “There’s this horrible stigma around people who have to go to pantries, but we’re trying to change that,” Jenkins said.